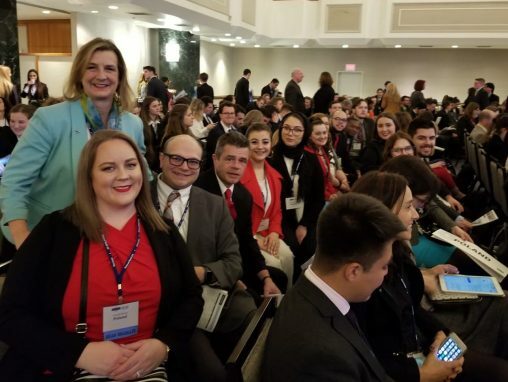 Competing with teams from 193 universities from around the world, the Wright State team was one of only 27 schools to receive an Outstanding Delegation Award, the highest recognition possible. “I’m proud of this team for bringing unprecedented poise and professionalism,” said Vaughn Shannon, associate professor of political science. He and Liam Anderson, professor of political science, are faculty advisors to the team. 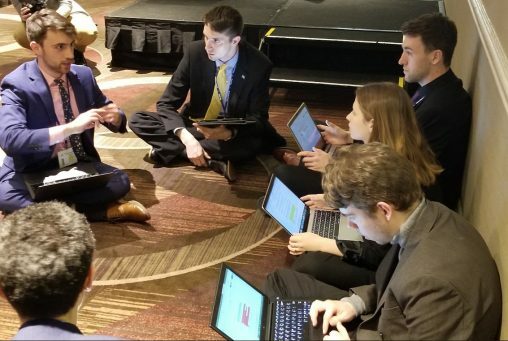 “The head delegates were leaders who earned the respect from the team, and the team stayed focused and came together to make Wright State’s 40th year at National Model UN an historic one,” Shannon added. Each university is assigned a country to represent and students participate as delegates to various UN committees by engaging in debates and discussions about some of the most pressing issues in the world today. Representing Poland, the Wright State team researched and formulated political positions based on Poland’s policies. Social media posts during the conference offered a glimpse at behind-the-scenes preparation and teamwork, personal reflections, as well as good wishes and congratulations from supporters. 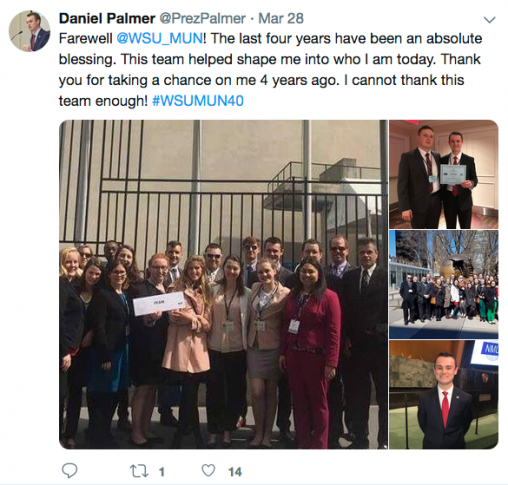 One of Palmer’s high school teachers was part of Wright State’s Model UN program and encouraged Palmer to join. Palmer interviewed as a freshman, made the team and has been involved the last four years. He will graduate from Wright State on May 4 and has aspirations to be president of the United States. The 2019 team includes head delegates Crystal Burns and Christian Cooper and student members Amanda Baker, Samantha Baxter, Daniel Bowman, Jackson Cornwell, Cameryn Drain, Leah Dryden, Salha El-Shwehdi, Derek Faulkner, Rahima Hamadi, Hannah Hays, Zachary Janow, Autumn Kern, Jarod Kiser, Ivan Mallett, Swaleh Ouma, Daniel Palmer, Gloria Pappaterra, Isabel Pappaterra, Meera Patel and Jaelynn Thomas. At work all week, Model UN team members collaborated on position papers at the national conference. Wright State students won six Outstanding Position Paper Awards and two peer-selected Outstanding Delegate in Committee Awards. 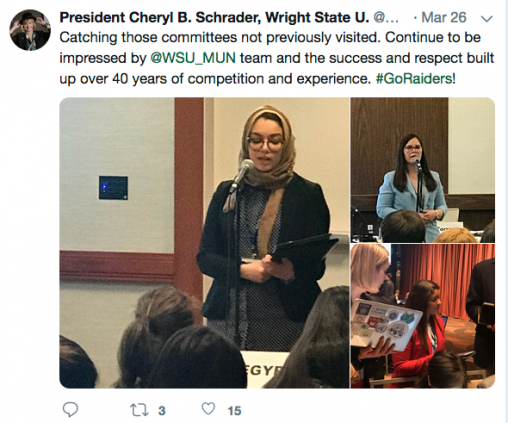 The Model UN program at Wright State is built around a spring semester course in Political Science, which emphasizes skills of teamwork, problem solving, diplomacy, public speaking, technical writing and researching. Preparation also involves learning how to implement a country’s policy, how to dress, how to act in committee and what to expect from other countries. While many of the team members major in political science or other majors in the College of Liberal Arts, the program is open to students from all majors and colleges. New member recruitment for the Model UN team takes place in September and October of fall semester each year. Joining the team involves three steps: an application, essay and interview. Students are also required to write a brief essay. National Model UN holds four annual conferences in New York City, Washington D.C., Canada and Ecuador. These attracted 6,239 students from 411 colleges and universities in 136 countries during the 2017-2018 academic year.